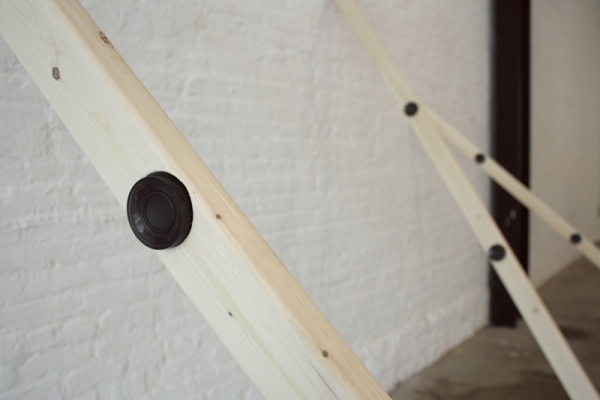 Wolowiec’s installation is based on a sequence of leaning wooden beams that have been modified with embedded speakers, which in turn play recordings of performers and actors reciting daily voice exercises. The chirps, trills, grunts and breaths, which serve as the essential building blocks of the performers’ formal renditions and include a range of perfunctory and graphic utterances, are not originally intended for an audience. Likewise, the unfinished beams projecting their vocalizations are characteristic of interior joints, typically hidden as components of a larger foundational framework. 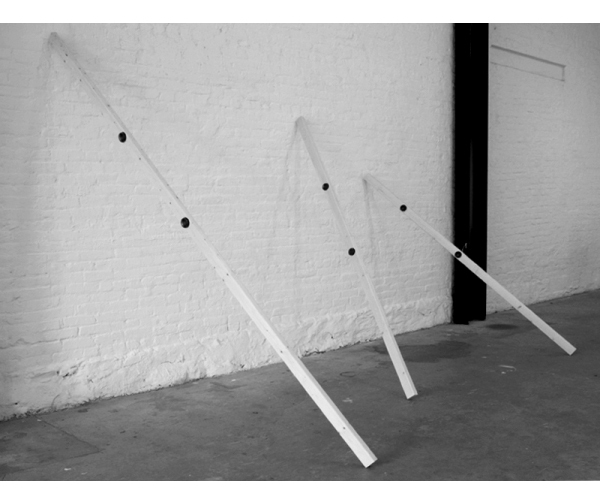 Thus both sound and object occupy a liminal space, an in-betweenness that feels incomplete yet uncannily exposed and accessible to the viewer.